Prior to Takeover: Blackpool, Jordan Devlin attacked Travis Banks. Tonight, Banks looks for revenge. Pete Dunne heads to the ring. Dunne says that history was made at Takeover: Blackpool. Part of that history is that Pete Dunn is still the WWE UK champ. Gallus comes out to the stage and slowly walks toward the ring. Joe Coffey says that Takeover doesn’t change a thing. 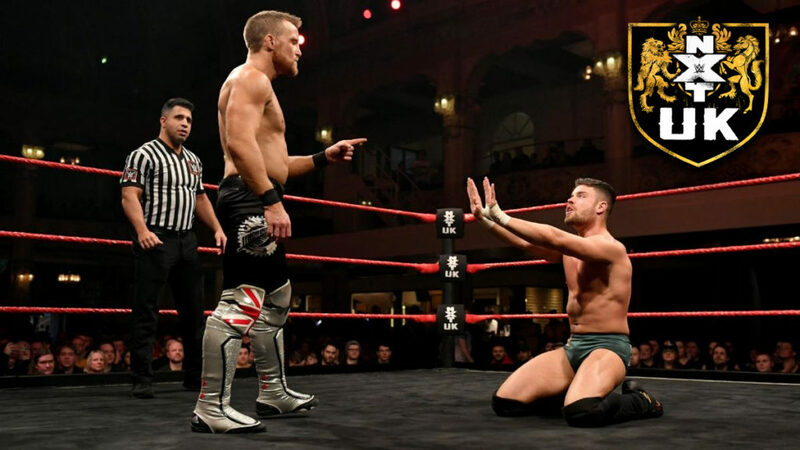 NXT UK is still Coffey’s kingdom, and he’s thinking of new ways to take the title from Dunne. We all know who’s waist the title will be around at the end of this war, and if anyone has a problem with that, they can get to the back of the line. Walter comes out and heads to the ring. Gallus starts to walk away, but Wolfgang and Mark Coffey turn around and rush back to attack Dunne and Walter. Dunne and Walter easily fight off Gallus. In the ring, Dunne stares at Walter, but Walter stares at the WWE UK Title. Walter doesn’t say anything before leaving the ring and walking away. Sid Scala says that NXT UK will be part of the WWE World’s Collide tournament, and they will be taping new episodes at the same time. James Drake and Zack Gibson walk by. Scala asks Drake and Gibson if they have any words for the press. Gibson says they’ll talk when they want to talk. Pretty good match. Nothing too wrong with it (though there was some weirdness with a move that looked like a Russian leg sweep, but the person giving it took damage instead). This was fine, and it was pretty good for Samuels. It could have been a squash, but it wasn’t, so I appreciate that. At Takeover, Radzi asked Moustache Mountain about their loss. Bate and Seven are very disappointed that they aren’t the first NXT UK tag champs, but winning the titles is still their goal. At Takeover, Radzi welcomed Toni Storm. Storm says winning the Mae Young Classic changed her. This was fine. It didn’t make me a fan of Dennis, and it didn’t surprise me in any way. This was probably just a way for Dennis to get a win back after losing twice to Mastiff. Good match. Banks was furious in this match, and he fought furiously. Devlin hit some big moves to slow Banks down, but Banks wouldn’t be slowed down for long. This match was full of big moves and hard-hitting action. Banks seemed to be running on adrenaline while Devlin was doing his best just to stay on his feet at times. The finish was less than satisfying, but it’s clear that they did it that way so this feud can continue. I’m very okay with that. After the match, Banks and Devlin brawl out into the crowd. I liked this show, but pretty much only for the main event. The rest of the show felt like some character building segments, and since Eddie Dennis was one of those characters, I wasn’t too into it. The main event was really good though. This was ultimately just a buildup to an even better match, but this was a great preview for that eventual battle.